Click HERE for April 2019 Calendar. We are proud to be the only NTA certified dance instructors in the Treasure Valley. 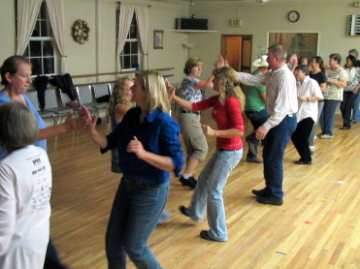 NTA is an organization for improving the quality of dance instruction to enable teachers to provide more evocative instruction in the art and practice of Country Western Dancing. To keep our teaching current we also travel throughout the year to various dance events to learn from the country's best trained professionals. Our goal is to provide you with the latest and best dance instruction to get you out on the social dance floor. We provide private & group instruction in country swing, 2-step, east coast swing, west coast swing, patterns, line and more. Check out our website pages for more information. Join us for a lesson or dance and you'll see that we're in it for the fun of dancing! Never-too-loud DJ music. Music requests encouraged. Partner optional. Inexpensive alcoholic & non-alcoholic drinks available. Free popcorn. $5 to the Eagles for opening their facility so we are able to dance Wednesday nights. All Ages. Remember to tip the bartender. Nothing but dancing. NO instruction. Music will play non-stop for line dances. If you don't know our dance, try one of your own or grab a partner and dance around the line dancers. You will have a chance to dance line dances, mixers and patterns, including some lessons with some country 2-step, west coast swing, country swing, etc...on the side. Saturdays, House Band, Nampa Eagles, 118 11th Ave. N., Nampa. 8:00-12:00, $8. If you are interested in group or private lessons email Randy or call: R2L2Dance@gmail.com or 941-4853. Have the courage to be bad at something new. Imagine all the new things you could have done, but were too vain to look bad at it. Bring us your two left feet. You CAN learn to dance. 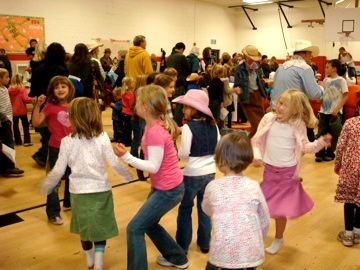 Friday Night Dances are held at the Nampa Eagles two Fridays a month. More info HERE. For SALE: Portable dance floor. Click HERE for more information. Art by Randy Lattimer Check out Randy's artwork. Private & Group Dance Lessons - We teach private and group dance lessons in country 2-step, west coast swing, east coast swing, country swing, polka, country waltz, and pattern dances (Desperado Wrap, Cowboy Cha Cha, Schottische, Shadow, Drifter, River City Cha Cha, Mexican Wind, Colorado Cha Cha, Horseshoe, etc. 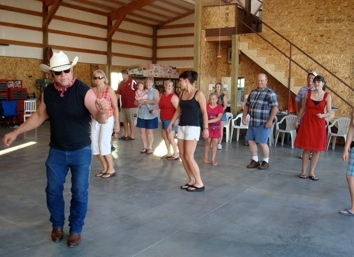 ), line dance and mixer dances. 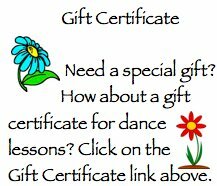 Click on the "private lessons" or "2018 group dance lessons" link above for more information. Call Randy at 208-941-4853. 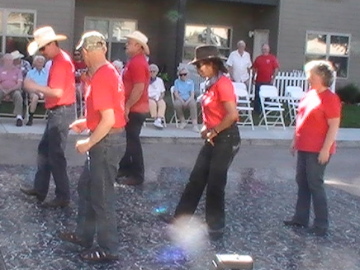 Line dance group lessons for all ages and abilities. ->Sundays from 4:30 to 7:00 Homecourt in Meridian. No experience necessary. Register with the City of Meridian. ->Wednesdays 7:00-9:00 at the Nampa Eagles, $5. Contact Randy at 941-4853 for more information. 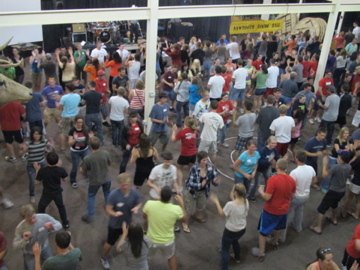 So much fun DJing and teaching line dancing at the NNU Freshman retreat. What a hoot! . We can DJ a party in your garage. We can even DJ a party in a barn. 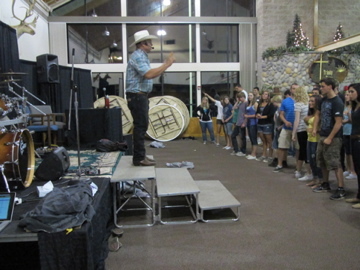 Who else DJ's and teaches line dancing at NNU? Only R2L2! July 23, 2011 - Party at Sam & Jan's. They graciously offered their spacious Nampa home and yard for our Annual Summer Picnic with games, music, food, dancing. We put up our portable dance floor, started gathering at 5:00 and finally turned off the music at 11:35. BBQ Beef and Pork provided by the Smoking Cowboys of Jerome, ID. WHAT A NIGHT! The 2012 picnic will be held August 4. Visit this link for more information. Had a good time volunteering to teach some dance steps to the first, second and third graders at the Boys and Girls Club. We set up our floor near Melba. 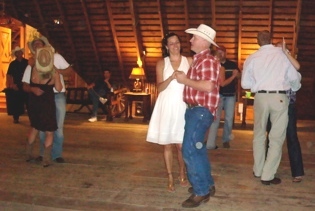 Randy taught some line dancing and later that night Straightaway played while dancers filled the floor.